There is one love that I believe to share with millions of others: fresh asparagus. I think this love is not only about the gorgeous flavour of the vegetable itself but also about the time of the year when it is in season. After months and months of cold and gloomy weather and winter tomatoes tasting like cardboard, the sun finally comes out and fresh European asparagus hits our local supermarkets. What else can you really ask for? Well, maybe apart from Benedict Cumberbatch (another love that I believe to share with millions of others) joining you to share this deliziose asparagus lasagne, that is. As today is Easter Monday, I browsed the internet for some Italian Easter food. 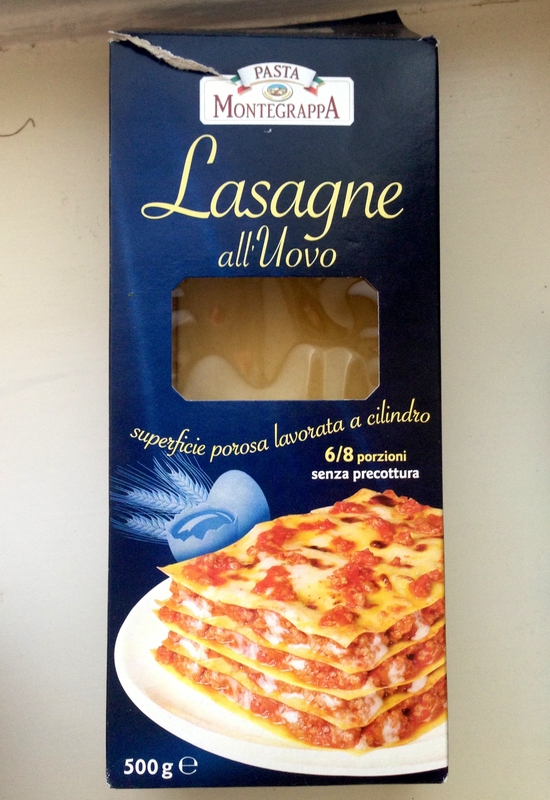 A lasagne with asparagus was one of the commonly proposed dishes. This version is a bit lighter than some others as there is no bechamel sauce included. I substituted the proposed prosciutto with some slices of smoked turkey and a few knobs of butter since I expected the turkey to be a bit drier than cured ham. Some of these lasagne recipes included smoked salmon instead of ham, and I am quite sure that this lasagne would work well with that too. A proper Italian nonna would obviously also make the pasta by herself but since I am not one and was recovering from a bout of cold, I used these ready albeit quite nice lasagne sheets. This package also contained advice on a neat trick though which I hadn’t seen before: you can precook the sheets in boiling water for 8-10 minutes which reduces their required baking time in the oven. I did this and the dry sheets actually started to resemble fresh pasta. However, I didn’t quite yet master the art of keeping the sheets apart. Hence, the precooked sheets (stuck together and torn apart) did really resemble something that I would have made myself giving my lasagne a very authentic home-made look..! Clean the asparagus, remove their chalks and cook them in salted, boiling water until ready (~ 5 minutes). Put the cooked asparagus in a blender together with the ricotta cheese, mix well and season with olive oil, salt, pepper and a pinch of nutmeg. Take a buttered lasagne dish and place the first layer of lasagne sheets in it. Add a layer of the asparagus followed by a layer of the prosciutto cubes. Repeat these steps several times (I made four layers). On top of your lasagne, add one more layer of the sheets and the grated cheese. Bake in the oven at 180C for 20-30 minutes if you are using dry but precooked lasagne sheets (30-40 minutes without precooking) or for 15 minutes if you are using fresh pasta. A couple of months ago, I tried making a risotto that included a cheese that I was not familiar with: Taleggio. As this cheese isn’t really included in your grocery staples in Finland, I couldn’t find it in my local corner store either and used Swiss Gruyere as a substitute (well, not exactly a grocery staple in Finland either…). However, last week I managed to get my very first chunk of Taleggio and to top my happiness, it was even on sale. The flavour of Taleggio is a bit different from any other cheese that I have tried before. I would describe it as something between brie and mozzarella. It definitely has that flavour typical of a mold cheese but it is milder and its texture is not quite as soft as brie’s. It certainly worked so well with the risotto that I went back to the great Taleggio sale and bought another piece. This time I tested it with potatoes and rosemary as suggested by this recipe. Rosemary is one of my favourite herbs which in cooperation with my new friend Tal makes this recipe quite a nice side dish to accompany chicken or red meat! Cook the potatoes in boiling, unsalted water for only 10 minutes. Peel them and cut them into thin slices (~0.5 cm thick). Place the potato slices in a buttered gratin dish. Add the milk and season the potatoes with salt, pepper and chopped rosemary. Bake in the oven at 200C for 20 minutes. Slice the Taleggio and remove its crust. Cover the potatoes with the cheese and continue cooking for another 10 minutes. Allow the ready dish to cool for a few minutes before serving. 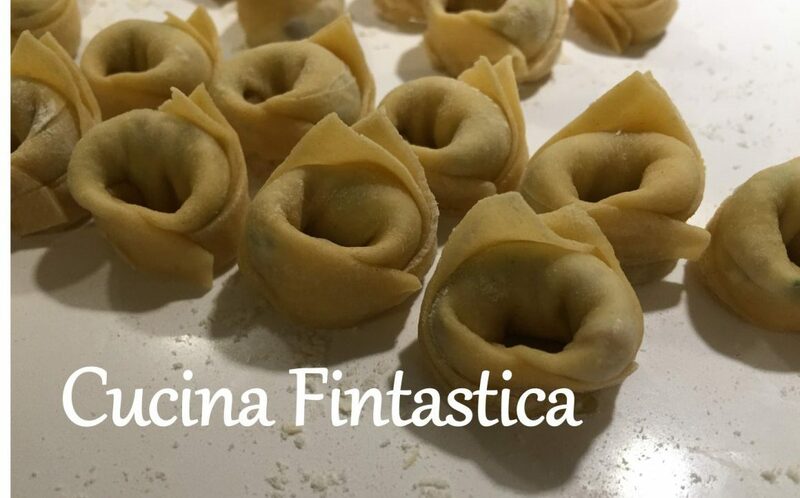 Italian recipes often include a grading of their difficulty. This is something that is slightly distracting to my somewhat competitive nature. As a result, I have already been toying with the idea of testing a cake with the grade “for experts”. 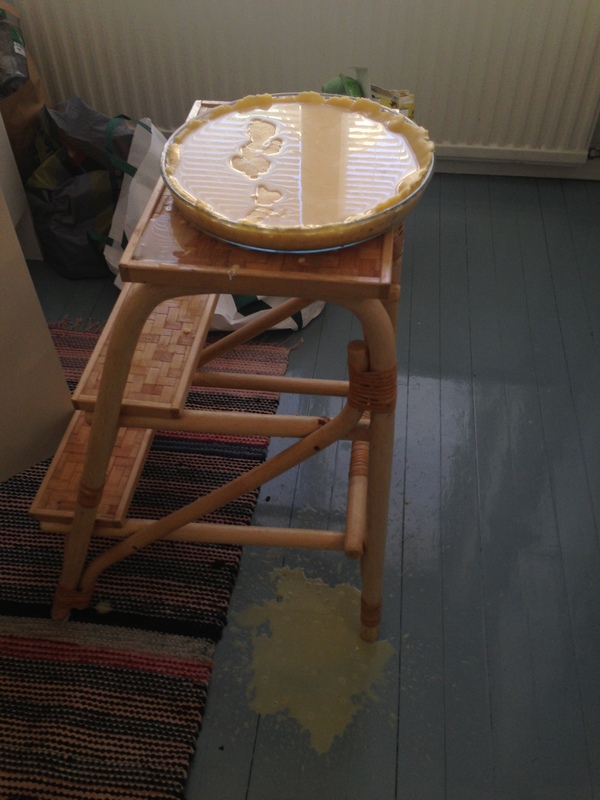 With my limited baking skills, it is a terrible idea – especially considering my latest kitchen disaster last weekend (I may tell you all about it later…). However, as most of the recipes on this blog to-date have been graded “easy”, I thought it would anyway be time to raise the bar, and go for a medium level dish. It is a soup from the “La Cucina Italiana” magazine that I bought some weeks ago. I still ended up taking a few shortcuts as I made this soup on an ordinary Tuesday evening: According to the recipe, you are also supposed to cook your chickpea flour in boiling water for 40 minutes. My mixture obtained the desired porridge like consistency within about 40 seconds. There was also no mention on the package of chickpea flour being lethal if you cook it for less than 40 minutes (I hadn’t used chickpea flour before). Hence I presumed that 40 minutes was in fact a typo for 4 minutes. Even with the few shortcuts, the result was quite nice and certainly worth the little extra effort. I particularly liked the nice touch of the fried chickpea flour which also gives a bit extra protein for your muscles in addition to those mussels! Bring 200 g of lightly salted water to a boil. Remove the kettle from the heat and stir in the chickpea flour. Return the kettle to the stove and cook for a few minutes continuously stirring until you have a “porridge” type of mixture. Pour the mixture into a bowl, cover it and place it into a fridge. Peel the potatoes and slice them. Clean the cauliflower and cut it into small chunks. Clean the onions and peel them. Put the onion peels into a kettle with 2 litres of lightly salted boiling water and cook for some minutes. This way you will obtain a light broth for your soup. Chop the onions and gently fry them in a pan with 2 tablespoons of olive oil but do not let them brown. Add the cauliflower and potatoes, salt and white pepper and let them gain flavour for 3-4 minutes. Pour the vegetable mix into the kettle with the broth and let them cook for 25-30 minutes. Heat 2 tablespoons of olive oil in a frying pan. Add the crushed garlic clove, the chopped chilli, the sliced fennels and the chopped parsley and fry them for a few minutes. Stir the smoked or frozen mussels into the mixture and heat them. Heat 2 tablespoons of olive oil in a frying pan. Add the crushed garlic clove, the chilli (entire or chopped) and the parsley. Add the well-cleaned and –washed mussels (here is another BBC clip on how to do that). Cover the pan with a lid and cook for 3 minutes until the mussels have opened. Again – please discard the mussels that haven’t opened! Let the open mussels cool. Take the mussel meat from the shells and filter the cooking liquid. Return the cooking liquid into the pan and cook it for 3 minutes with a little bit of olive oil and sliced fennel. Add the shelled mussels and reheat them. Pour some of the cooking liquid of the vegetables into a bowl. Blend the soup. Add some of the cooking liquid if needed to achieve the right consistency for the soup. Remove the chickpea flour “porridge” from the fridge and cut it into small cubes. Fry the cubes in olive oil and drain them on a kitchen towel. Serve the soup with the mussels and their sauce and the fried chickpea flour cubes.